Winter is in full swing and there is no better way to enjoy the beauty of the season than to venture to one of the many parks that make up the Great Parks of Hamilton County. 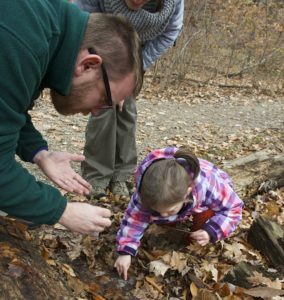 There is plenty for the whole family to do and the kiddos will love exploring the outdoors while having fun and learning more about nature. Take a peak at this handy calendar of events and start planning your trip to the Great Parks of Hamilton County today! Date and Time: Tue 1/3, 11 a.m. & 1 p.m.
Parents and children are invited to join us for a short story and activity about this sign of the season! Date and Time: Sun 1/8, 5:30 p.m. In the deep depths of Sharon Woods, there are creatures that are rarely seen. Join the naturalist as we go off trail in search of owls. Date and Time: Sun 1/15, 2 p.m.
Have you seen any of these furry critters in your yard lately? Join us to discover how you can contribute your own observations to this exciting citizen science project. No prior knowledge is required! Date and Time: Thu 1/19, 11 a.m.
Parents, bring your 3–5 year-old to learn all about some of the birds we see at the winter feeder! Children will enjoy making a craft, reading a story and an activity. Date and Time: Fri 1/20, 6 p.m.
For centuries, the stars have been full of mystery. Come take an evening walk as we explore some of the myths and legends surrounding the constellations. Date and Time: Sat 1/28, 3 p.m.
Get the scoop on squirrels, rats, mice and their cousins as we learn all about the wild rodents that live in Ohio. We’ll also meet Sharon Woods’ resident rats in person. For ages 8 and up. Date and Time: Sun 1/29, 2 p.m.
Winter may not have the obvious abundance of wildlife as spring and summer, but hidden beneath the snow and hiding behind the dark of winter’s night, there are wonders to behold. 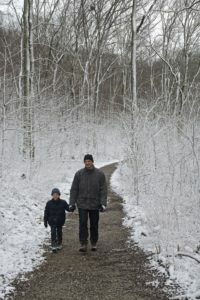 Bring your family to Sharon Woods to experience some of the wonders of winter. Even though the weather is cold, the sheep are still playing outdoors. Come learn how their wool keeps them warm and can keep you warm, too. For children ages 2–5 accompanied by an adult. Date and Time: Sat 1/14 & Sun 1/29, 1 p.m.
Aiming for a new way to enjoy the great outdoors? Try out your skills with a little target practice! 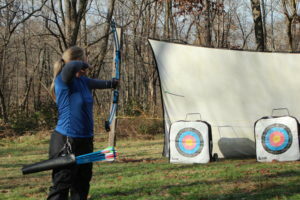 Our archery instructor will guide you through the basics of shooting a compound bow while explaining the archery steps to success. All equipment is provided. For adults and children ages 8 and up. Date and Time: Sun 1/22, 2 p.m.
Winter is probably the best time to discover where animals have been active. Sharpen your observation skills and unravel some of nature’s mysteries. The skill to create fire is crucial for survival by providing heat, water purification, signaling, food preparation and comfort. We’ll go over different fire-starting techniques before participants take on a s’more challenge! Date and Time: Sat 1/28, 10 a.m. Calling on hats of all kinds! We want color, flash, variety and the most remarkable! Wear it proudly as we traverse a woodland path. Date and Time: Mon 1/30, 11 a.m.
Home-schooled students, ages 5–12, and parents are invited to explore interactive learning stations, take part in lessons and enjoy a guided hike. Date and Time: Thu 1/12, 6 p.m.
Flickering flames and frosty air will be our partners this evening as we watch the first full moonrise of the year. We will share storytelling and hot chocolate. Date and Time: Fri 1/13, 11 a.m.
Register your 2–4 year-old for this exciting program all about one of our favorite fuzzy animals. The program will be followed by story time and a craft. Date and Time: Sat 1/14, 2 p.m. Date and Time: Sun 1/15, 1 p.m.
Meet some of our feathered, furry and scaly friends and learn about their amazing features as we celebrate the beginning of the new year. Date and Time: Thu 1/19, 1–3 p.m.
Home-schooled students, ages 5–12, and parents are invited to explore interactive learning stations, lessons and a guided outdoor exploration. Date and Time: Sun 1/29, 1 p.m.
Can you tell who left their feathers behind? Get some tips and tricks to identify single feathers and then test your knowledge. Date and Time: Sun 1/15, 1–3 p.m.
Children ages 5–12 will enjoy making winter-themed crafts. Kids can make up to two crafts to take home. Date and Time: Fri 1/20, 10 a.m.
Register your 3–5 year-old for this month’s jamboree. Through crafts and activities, we will learn all about foxes. Buds and bark is the key to winter tree identification. 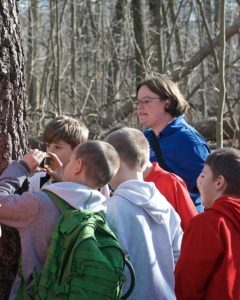 Join the naturalist as we hike and learn all about trees in winter. Date and Time: Thu 1/26, 11 a.m.
Is old man winter keeping you trapped inside? Come out and join us for a laid back stroll along the trail to help relieve your cabin fever! Please wear your sturdy hiking shoes for this hike in case of icy conditions. Date and Time: Sun 1/22, 3 p.m.
Join us as we try to get the perfect shot of a national symbol that lives in the parks: the bald eagle. Photojournalist Malinda Hartong will share tips for getting great pictures with your smartphone or SLR camera. Longer lenses will be available for you to borrow and use with your camera. No photography experience is necessary! Date and Time: Mon 1/16, 11 a.m. & 1 p.m. Kids, bring your grown-up to learn all about nature in winter! We’ll take a hike, have some hot chocolate and make a craft. This two-session class is for beginning woodcarvers. Carve a small decorative shelf goose in a natural finish. Wood blank and pattern provided. You must provide your own knife or you may purchase one from the instructor at the time of the program. Date and Time: Wed 1/25–Sun 2/5, Wed–Sat, 10:45 a.m., 1 p.m. & 4 p.m. & Sun, 1 & 4 p.m. While we are sleeping and keeping warm inside, the garden’s residents are living their lives and leaving clues in the snow and mud. Get ready to be a garden detective and see what they have been up to.